There are options beyond the traditional for every decision you make. Products and services can be bought from “non-wedding” vendors, or you can take the DIY route. You can utilize items in less-than-usual ways or even skip a tradition entirely, and you can often save money along these less-worn paths. As you’ve probably already discovered, weddings are a BIG business. As of this writing, more than 57 billion dollars is spent on 2.2 million weddings annually. This doesn’t even take into account the money vendors spend on advertising, trade shows, and other business expenses. All in all, quite a lot of noise in a large industry. There are several ways you can bypass the hubbub. • Shop non-wedding vendors, retailers, and online sellers for potential savings. It’s perfectly OK to stay within the established industry. For example, wedding professionals know what you are going through and are in a position to offer advice as well as tried-and-true products. But you can usually find better bargains along the less worn paths. Every product and service sold by “wedding” vendors can also be found elsewhere. You may find regular prices that are lower than those of vendors’ sales prices and, through some avenues, at crazy rock-bottom prices. • Make your own traditions or skip some entirely. Another way to look at the “road less traveled” is through your own uniqueness. A common line of reasoning for doing something a particular way is “because that’s the way it’s done”—a weak argument at best. Often, the way it’s done is pricey, and you don’t even care if it’s part of your wedding! – Instead of guests throwing rice or birdseed as you come out of the church, play music and have everyone dance. – If there are no obvious choices for flower girls and ring bearers, omit them from the ceremony. • Do it yourself if you have the resources, and it makes financial sense for you to do so. Because of your expertise or that of someone close to you, pieces of your wedding will be easy for you. You can save money by keeping those projects in-house and doing them yourself. You will find parts of Section 2 devoted to these types of decisions as they relate to vendors and Section 3 as they relate to products. Follow these suggestions, or come up with your own to create a ceremony and reception that reflect who you truly are as a couple. Any aspect of the wedding, short of the legalities, is optional or open to your own interpretation. 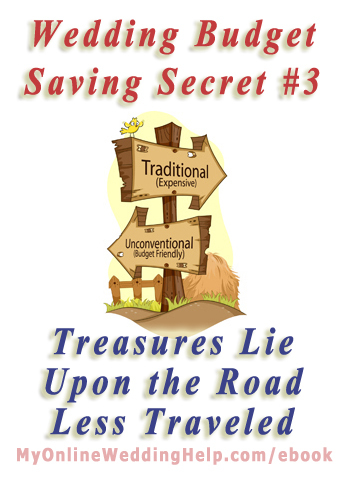 Throughout the Dream Wedding on a Dime; 7 Secrets for the Budget-Savvy Bride ebook I have marked select tips with “(Secret: Path less traveled).” These are more tips for finding alternate sources and traditions. Go to MyOnlineWeddingHelp.com/ebook for more information about the ebook.